At the Sheep and Wool Festival of 2006, I bought a drop spindle and a bag of carded llama wool. I struggled to learn how to use it. The directions that came with the spindle were not enough, and I wasn’t aware of youtube yet. My local yarn shop did not give lessons in spinning, so I put it away. It’s a little better? Both are single ply, partly because I LIKE single ply and partly because I didn’t understand 2-ply. I never did get the hang of spinning beyond beginner technique, and I figured that was enough for that year. I’d buy a wheel when ALL the kids were out of the house and I had simply nothing else to do. A couple years went by before I went back to the Sheep and Wool festival. One year I had to choose between my youngest daughter’s First Holy Communion and the festival. They were on the same Saturday and for some reason I couldn’t go Sunday either. Hmmmm…….OK, OK, yeah there was no real choice. Then the next year, Rebecca formed Osborn Fiber Studio. As a mom, nothing was going to hold me back from visiting her corner at the Cloverhill booth at Sheep and Wool 2010. What a booth! 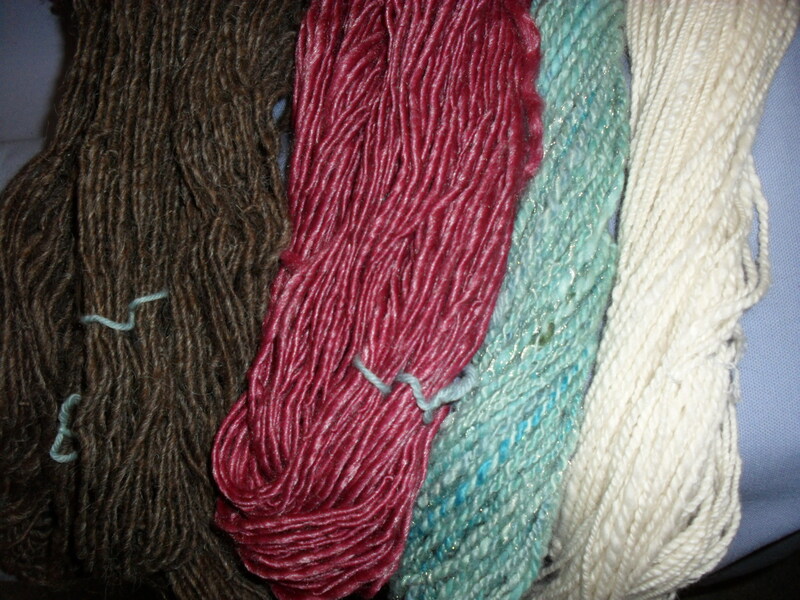 While I was there, I bought a Batt of Gnome fibers in gorgeous colors of teal. I had seen Rebecca learn to use a drop spindle (she took a class at Cloverhill Yarn Shop) so maybe I could try it again. The shop was a little far away, so instead of lessons I bought a book called, “Spinning in the Old Way”. I went home and spun half of it, got discouraged and left it on the shelf for a year. But after Sheep and Wool 2011, I decided to try again. I finally finished the batt…. I was pleased with it, but if you look closely, you can see the kinks. 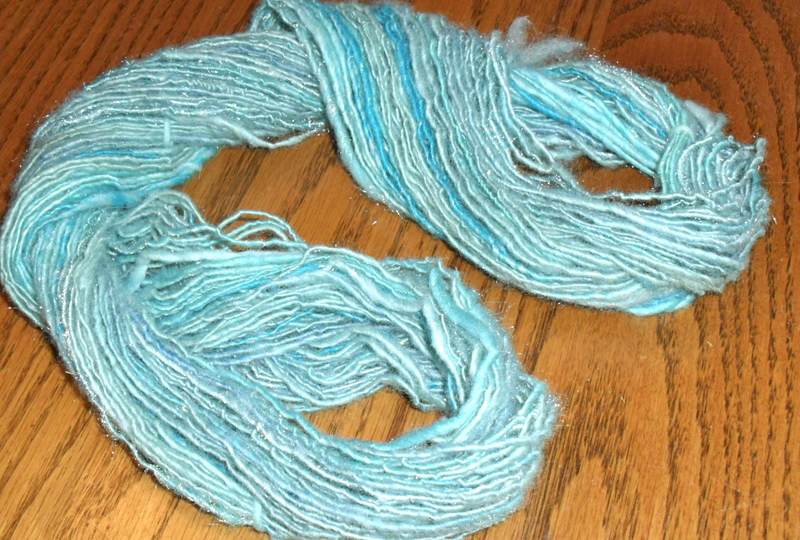 It was over-spun….much more so than the pink merino I did. I tried to knit with it but it felt weird with all those kinks. It went from being a DK/worsted yarn to bulky, but at least it is more balanced and nicer to the touch. I was thrilled with the even thread, the way it was plied, the balance, and the soft texture of it. It even matches reasonably with the stuff I bought. Here they are side by side, mine on the right. Mine is still heavier, but it’s not bad. And heck, it only cost $12 to make, opposed to $36 for the already spun stuff. I guess that’s one reason to learn to spin. So what did I learn with all of that? A LOT!! 1) I learned that stuff to spin comes in several forms. You can buy it as a fleece, either cleaned or not. 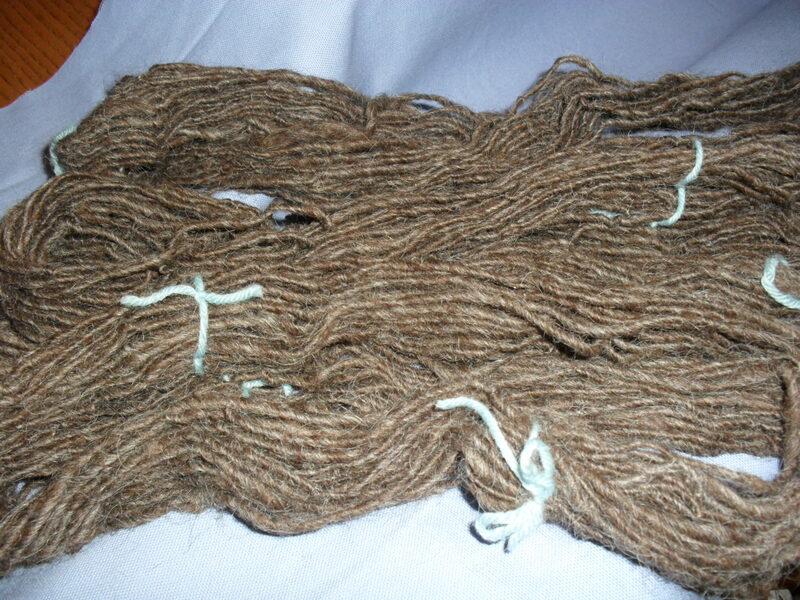 Or you can buy it cleaned and carded in various amounts, called either roving or batts or tops. 2) Pre-drafting is KEY to spinning for a beginner. Here’s an example of that from the Gnome batt. 3) I learned that plying your spun thread is something that almost everyone does. It was covered in my Beginner’s class. It’s a Beginner’s technique. It’s actually harder to make a slim, balanced, even 1-ply. 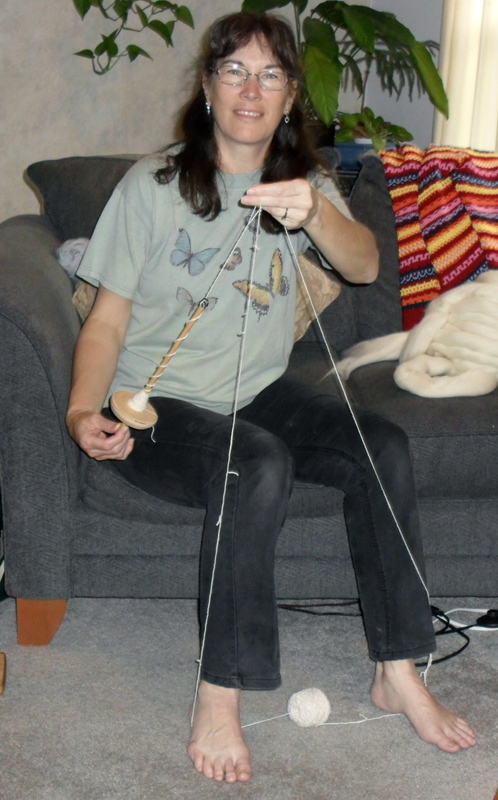 4) Balance is how the yarn hangs, how the spin affects the fibers. If your spun yarn is not balanced, the stitches will lean. 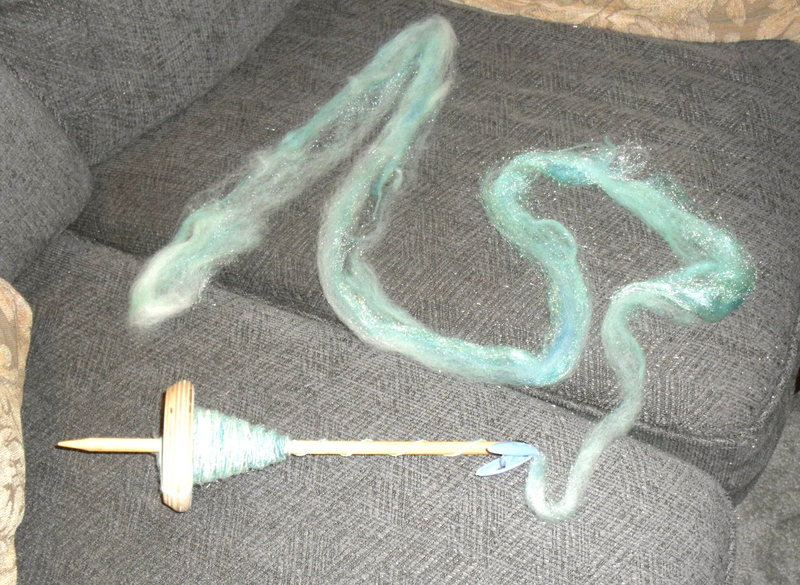 5) There are two ways to spin yarn, to the left and to the right, called S and Z twist. 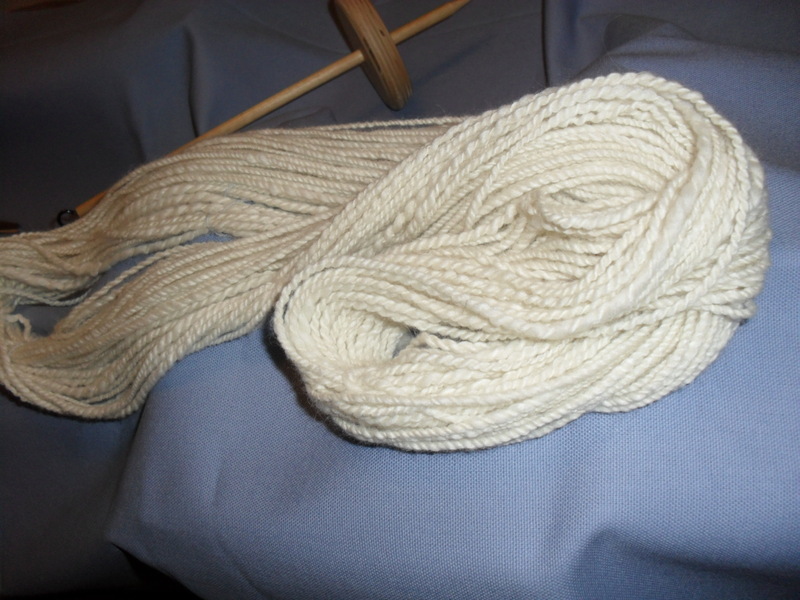 Traditionally, all yarn is spun with a Z twist, then are plied together with an S twist. The above is a youtube link to watch a 1-min. video of this technique. It worked quite well and the yarn coming from both sides of the ball almost never tangled! 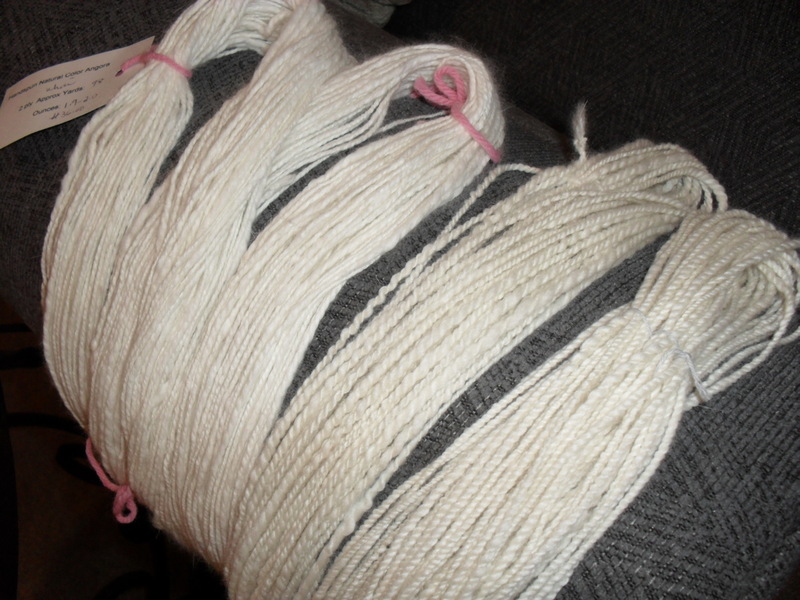 7) Once you are done, the yarn is still not as balanced as you’d like. 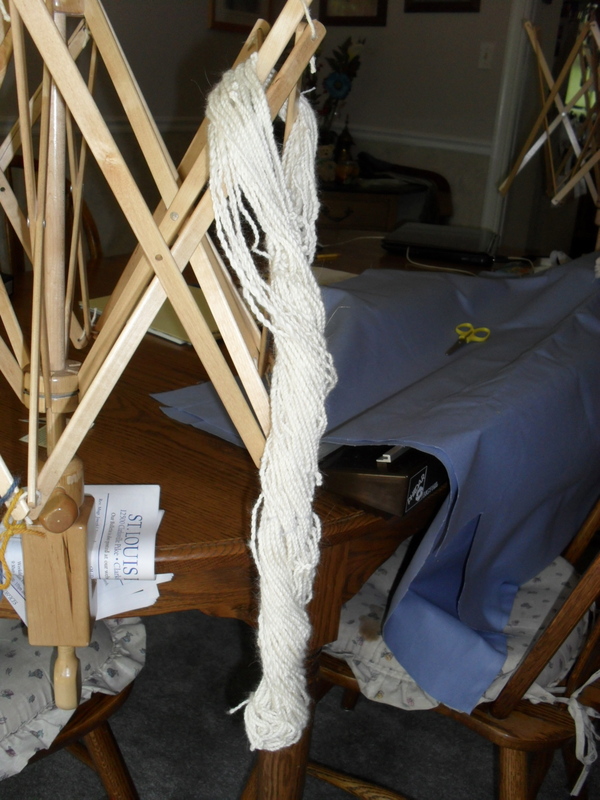 Here’s a picture of the angora/merino/silk hanging from my swift. See how it twists instead of hanging straight? So you have to block it. 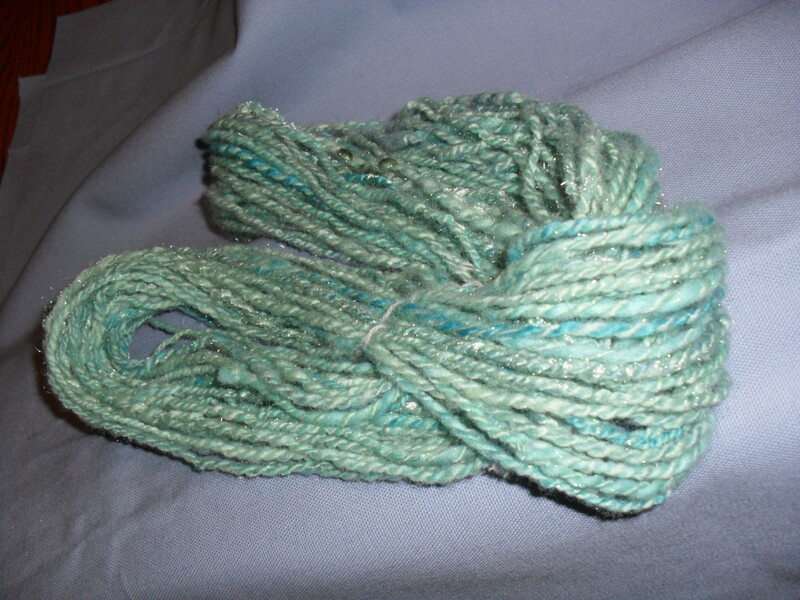 You place the yarn in a very warm/hot water bath with a little eucalan in it (or mild soap). Let it soak for half an hour. You don’t have to rinse it. Gently squeeze out the water, roll it in a towel, and hang it. If it still twists, you can hang a soup can/pan/etc. on it to gently pull it straight. Let it dry! 8) If you persist, you can learn something new! Heck, it took me 4 years and about $700 worth of lessons to learn to swing a golf club decently. It only took me 4 2-0z batts/rovings and $60 of lessons/books to learn to spin on a drop spindle decently. And the equipment and material was cheap! Here they are all together. How long did it take you? Now I’ve bought an Ashford spinning wheel and I’m hooked. But that’s for another post. Great job, mommy! It remains the amazing irony of spinning that I am working toward being able to spin all of those “beginner” yarns that you made. 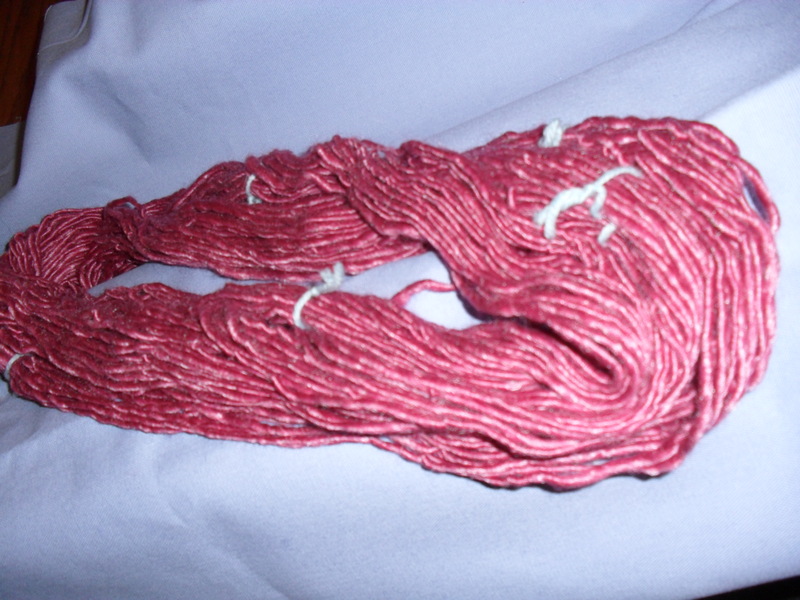 The red merino is amazing! So even and pretty!